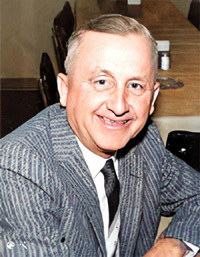 Dr. Armin "Doc" Kettelhut had a successful dental practice in Minonk and was well known through out the area. He was born in Homewood, Illinois, 1898, one of three sons of the Rev. 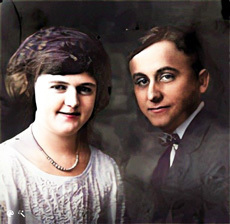 Theodore Kettelhut and Augusta Kettelhut. Rev. Kettelhut was the pastor of the St Paul's Evangelical and Reformed Church in Minonk from 1905 until 1921. On June 5th, 1923, Doc Kettelhut married Rachel Seggerman, the daughter of Mr. and Mrs. Henry Seggerman of Minonk. He loved to have fun. In the 20's he had a dance band called "Doc's Melody Boys", they played at dances and functions almost anytime they were asked. He was a great ragtime piano player pounding out such little ditties as: "I'll Be Down To get you in a Taxi, Honey", "Sweet Georgia Brown" and many others. He also loved to sing. He was in the Presbyterian Church choir and also sang "barbershop" with "Babe" Smith and others. He was a veteran of WWI, but never made it overseas. As he embarked, his ship was called back as the war had ended. Tragedy struck when he lost everything in the Sutton Building fire in the 1940's. But, he pulled himself up and started over again. He purchased the John Zika brick building on Sixth Street where he practiced until his death in 1962. Rachel died in 1998, after a long illness. 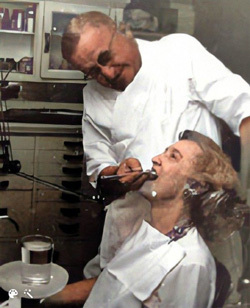 Below is the "painless" dentist at work. Doc and Rachel lived at 311 Maple Ave in Minonk. 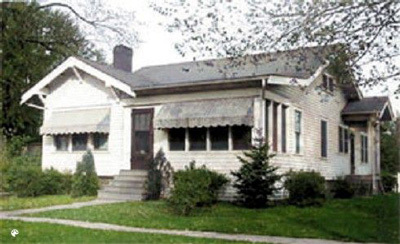 It was a comfortable home and some of the best days of my childhood were spent in that house. Doc loved Minonk and it's fine people. His death came quickly, but the memories will always linger. **Story by Art Kettelhut, son of "Doc" Kettlehut.